I think our society needs a huge "Wake-up" call. As a shelter manager, I am going to share a little insight with you all...a view from the inside if you will. First off, all of you breeders/sellers should be made to work in the "back" of an animal shelter for just one day. Maybe if you saw the life drain from a few sad, lost, confused eyes, you would change your mind about breeding and selling to people you don't even know. That puppy you just sold will most likely end up in my shelter when it's not a cute little puppy anymore. So how would you feel if you knew that there's about a 90% chance that dog will never walk out of the shelter it is going to be dumped at? Purebred or not! About 50% of all of the dogs that are "owner surrenders" or "strays", that come into my shelter are purebred dogs. The most common excuses I hear are; "We are moving and we can't take our dog (or cat)." Really? Where are you moving too that doesn't allow pets? Or they say "The dog got bigger than we thought it would". How big did you think a German Shepherd would get? "We don't have time for her". Really? I work a 10-12 hour day and still have time for my 6 dogs! "She's tearing up our yard". How about making her a part of your family? They always tell me "We just don't want to have to stress about finding a place for her we know she'll get adopted, she's a good dog". Odds are your pet won't get adopted & how stressful do you think being in a shelter is? Well, let me tell you, your pet has 72 hours to find a new family from the moment you drop it off. Sometimes a little longer if the shelter isn't full and your dog manages to stay completely healthy. If it sniffles, it dies. Your pet will be confined to a small run/kennel in a room with about 25 other barking or crying animals. It will have to relieve itself where it eats and sleeps. It will be depressed and it will cry constantly for the family that abandoned it. If your pet is lucky, I will have enough volunteers in that day to take him/her for a walk. If I don't, your pet won't get any attention besides having a bowl of food slid under the kennel door and the waste sprayed out of its pen with a high-powered hose. If your dog is big, black or any of the "Bully" breeds (pit bull, rottie, mastiff, etc) it was pretty much dead when you walked it through the front door. Those dogs just don't get adopted. It doesn't matter how 'sweet' or 'well behaved' they are. If your dog doesn't get adopted within its 72 hours and the shelter is full, it will be destroyed. If the shelter isn't full and your dog is good enough, and of a desirable enough breed it may get a stay of execution, but not for long . Most dogs get very kennel protective after about a week and are destroyed for showing aggression. Even the sweetest dogs will turn in this environment. If your pet makes it over all of those hurdles chances are it will get kennel cough or an upper respiratory infection and will be destroyed because shelters just don't have the funds to pay for even a $100 treatment. Here's a little euthanasia 101 for those of you that have never witnessed a perfectly healthy, scared animal being "put-down". First, your pet will be taken from its kennel on a leash. They always look like they think they are going for a walk happy, wagging their tails. Until they get to "The Room", every one of them freaks out and puts on the brakes when we get to the door. It must smell like death or they can feel the sad souls that are left in there, it's strange, but it happens with every one of them. Your dog or cat will be restrained, held down by 1 or 2 vet techs depending on the size and how freaked out they are. Then a euthanasia tech or a vet will start the process. They will find a vein in the front leg and inject a lethal dose of the "pink stuff". Hopefully your pet doesn't panic from being restrained and jerk. I've seen the needles tear out of a leg and been covered with the resulting blood and been deafened by the yelps and screams. They all don't just "go to sleep", sometimes they spasm for a while, gasp for air and defecate on themselves. 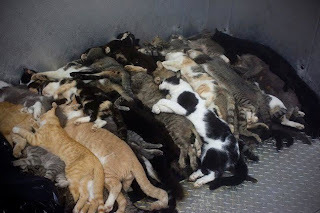 When it all ends, your pets corpse will be stacked like firewood in a large freezer in the back with all of the other animals that were killed waiting to be picked up like garbage. What happens next? Cremated? Taken to the dump? Rendered into pet food? You'll never know and it probably won't even cross your mind. It was just an animal and you can always buy another one, right? I hope that those of you that have read this are bawling your eyes out and can't get the pictures out of your head I deal with everyday on the way home from work. I hate my job, I hate that it exists & I hate that it will always be there unless you people make some changes and realize that the lives you are affecting go much farther than the pets you dump at a shelter. 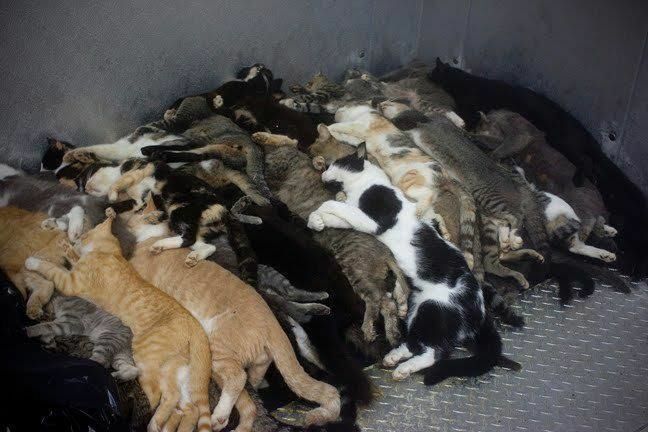 Between 9 and 11 MILLION animals die every year in shelters and only you can stop it. I do my best to save every life I can but rescues are always full, and there are more animals coming in everyday than there are homes. My point to all of this DON'T BREED OR BUY WHILE SHELTER PETS DIE! Hate me if you want to. The truth hurts and reality is what it is. I just hope I maybe changed one persons mind about breeding their dog, taking their loving pet to a shelter, or buying a dog. I hope that someone will walk into my shelter and say "I saw this and it made me want to adopt". THAT WOULD MAKE IT WORTH IT.